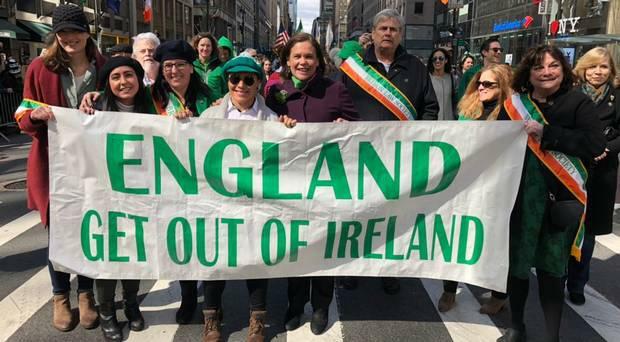 SINN Fein’s popularity has plummeted weeks after party leader Mary Lou McDonald posed behind a controversial banner reading “England get out of Ireland” at the St Patrick’s Day parade in New York City. Ms McDonald was roundly condemned by political leaders after she was photographed behind the sectarian banner. Tanaiste Simon Coveney said the banner was offensive, divisive and an embarrassment” and called on Ms McDonald to “grow up”. Now, the latest public opinion poll shows Sinn Fein’s support has nose dived five points with the party holding 13pc of the vote. In comparison, Fine Gael remains unchanged at 31pc while Fianna Fail is up one point to 25pc. In same opinion poll in February, Sinn Fein increased its support by five points to 18pc but the party has failed to hold on to any of those games in the wake of the St Patrick’s Day parade controversy. Despite on going Brexit concerns over the Irish border, Sinn Fein has also failed to negotiate an agreement with the Democratic Unionist Party (DUP) which would see the Northern Assembly restored. Meanwhile, the Sunday Business Post/Red C opinion poll shows small gains for the Independent Alliance 3pc (+1), The Green Party 3pc (+1), the Social Democrats 3pc (+1) and Solidarity-People Before Profit 2pc (+1). The Labour Party remains unchanged at 5pc.